Discussion in '☆☆ New Recruits ☆☆' started by Pete Boychuck, Jan 28, 2019. Hello Everyone, my name is Pete and I go by Peteb316 here on the forum (wrestling fan a longtime ago). In my 47 years on this Earth I have been interested in World War 2 for somewhere in the neighborhood of 35 years, ever since I found my Grandpa's box of his army things. I was told he fought in the Battle of the Bulge as did his older brother who was in the 82nd Airborne. I have also recently (past 8 years) been researching my Fiance's family history. She told me her grandfather also fought in the war, she wasn't sure where. 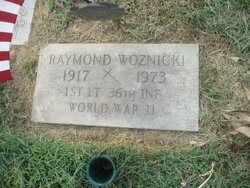 In talking with her mom, she told me her father Raymond Woznicki fought in the Battle of Monte Cassino and was wounded. She knows he received a Bronze Star and Purple Heart but is unsure if he received any other medals/citations. In researching him, I found he was a 1st Lt. in the 111th Combat Engineers (36th Infantry) . I look forward to reading as much as I can in the forums. Cheers Pete, welcome to the site. You apparently used your full name to register (which is fine), and I only mention it because it looks like you were trying to explain your handle "Peteb316" in your first post. Let me know if you'd like me to make any changes to your username or profile. I'm happy to help. Hello Pete. Welcome to the forum. If you have any other information, we'd be happy to see it. Welcome to the forums Pete! Welcome to the forums! Tom from NEPA. Yes, Lou, that is him. I don't have much, everything got misplaced after his wife moved in with one of their sons. My fiancé's mom has some photos of him and guys in the Company "lounging" in Germany, and I was able to get his Bronze Star and Purple Heart replaced, although I am not sure if he received other medals, ribbons, or citations. I have also recently (past 8 years) been researching my Fiance's family history. She told me her grandfather also fought in the war, she wasn't sure where. In talking with her mom, she told me her father Raymond Woznicki fought in the Battle of Monte Cassino and was wounded. She knows he received a Bronze Star and Purple Heart but is unsure if he received any other medals/citations. In researching him, I found he was a 1st Lt. in the 111th Combat Engineers (36th Infantry) . If he served in the 36th ID, the odds are pretty good he would have received a Purple Heart at Cassino (possibly the Rapido River crossing). They took a beating there. Welcome to the Forums, Pete. Pete Boychuck and Otto like this. Howdy Pete, good to have you join us and hope you can locate info about yours and your wife's family. Welcome to the Forums! Great to have another Pennsylvanian aboard! Thank you, I really hope so, it is definitely an experience researching everything, I learn something new about the war everyday. To answer your question, I am not a Penn State fan. I am a Notre Dame fan in college football, and my Alma Mater Villanova in college basketball. I grew up in Bridgeport, where there was and still is an Alabama Booster Club, so early on I rooted for both the Tide and the Irish. If I remember correctly, Coach Paul "Bear" Bryant actually paid the club a visit. Sorry for the log winded answer! Just watch...I can get long winded, although I am working not to. Welcome to the forum, Pete, I have family in both ends of the Keystone State. By a weird coincidence, I have been digging into some Bridgeport Pa. history. Do you or does anyone you know remember anything about the Lark Hotel?